Saturday 20th 07:30a CET : part of the problem has been fixed. My daughter's lockout was removed (as those of a number of people on internet) and the next update will provide better information on this process. Kudos Apple and Claudine from AppleCare! Additionally, it would seem an extra screen lets you select which account should be used by the new family member when you add him/her, preventing removals when you realize they are using the wrong oneí¢â‚¬Â¦ (I don't think this can be changed after). Apple's Family Sharing in an interesting idea which offers a long wanted way to manage Apple Store purchases within members of a family (among other features). Up until now, our solution was to each have our own Apple ID for iCloud related tasks (contacts, calendars, backup, etc. ), a common Apple ID linked to a credit card for purchases, and a third common account to manage Home Sharing. Not ideal, but it worked. With iOS 8 and Family Sharing, you can create a Family Group and add your family members to it. The Family Group creator allows the sharing of his credit card with the other members, without the need of sharing his Apple ID and password combo. Each member can purchase with his own Apple ID, and only one credit card is charged. Additionally, there is also easy photo and calendar sharing, as well as Find my Phone and Find my Friend functionalities. 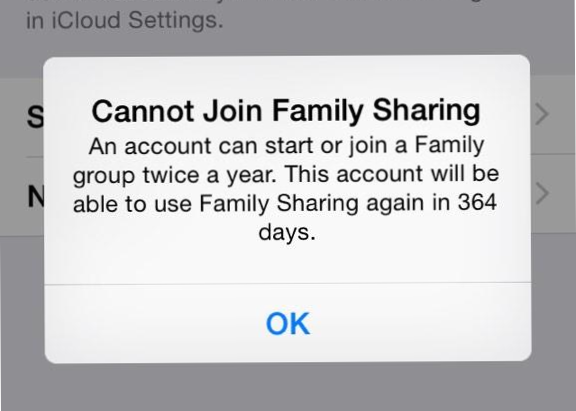 The caveat is that Apple neglected to warn us that there is a lockout period when you leave a Family Group. Now, you'll tell me this isn't the first time Apple limits a number of devices/people to access a group or a feature. Think of the maximum of 5 computers that can be authorized at once to download content from a single account on the Apple Store, or the 90 days grace period when switching accounts. But in both cases, you are warned by a dialog box of what is going to happen. With Family Sharing, add and remove the same member as little as twice (e.g. for testing purposes or because it didn't work the first go) and that account will be locked out for an entire year! Beyond the unreasonable length of the lockout period, there is no warning before hand! When you attempt to create or remove, either a Family Group or a member, a dialog box should warn you of what will happen! Granted, Apple published these guidelines on their website, but no one ever wrote about it, which leads me to think no one knew before experimenting with the feature. Not only is this a gross UX error on Apple's part, it's emotional. When a family member gets locked out of your Family Group, part of you reacts in a protective, emotional way that goes beyond a shortsighted feature implementation. Family Sharing is about people. Recently wrote a very simular article on this same subject. Thanks @Scott! I've added a link to your article. Like you (and many others) I had to establish an iTunes account with a non-Apple email years ago, and later my Apple email was used for my contacts, email, etc. with iCloud. So I've always had 2 accounts: @me.com / @icloud.com email for contacts/calendars/email etc, and my @gmail account for iTunes and apps. Now what do I do for Family Sharing? iOS 8 insists on only 1 email account. If I pick my music, etc. I lose my iCloud contacts on my phone and visa versa. I had problems getting the family sharing to work, and like in the past, when something technical isn't working,(I'm not technical) delete and start over. I'm now locked out for a year. Went into an apple store, they couldn't fix. Apple store set me up with an appt for an account representative to call me. The account representative also can't unlock my account. But guess what? My apple ID has been added to a "list" of people affected by this, and Apple may or may not be working on a solution...lucky me. Since my husband and I use the same apple ID account, ios8 has linked our phones. When my husband's phone gets a call both our phones ring, and when one of us gets a text, we both get it. This is a new "feature" of ios8, for info to ring across all of one's devices, and you can't turn it off. Family sharing is their solution to phones being linked...thanks apple!!! Can I still get locked out for a year for starting my own family share and then stopping it twice? You need to use separate Apple IDs for all iCloud related tasks such as mail, contact and calendar management, backup, â€¦ and the same Apple ID for purchases. Family Sharing enables you to use of the same Apple ID for purchases (meaning the same credit card is debited, apps and media are shared) while using your own Apple ID to authenticate. 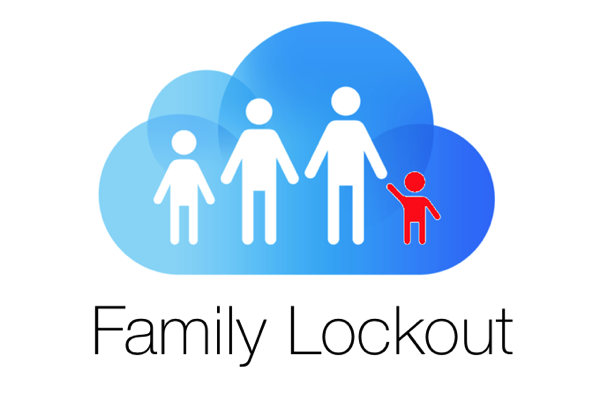 I would hope Apple addresses the Family Sharing lockout issue. Like many others, I played around with it after updating my household's iOS devices last week, just to see how it works, and got locked out after deactivating twice. Unfortunately, the Apple support supervisor with whom I spoke earlier today told me flat out I'd simply have to wait a year. Given that there was no warning that the account would be locked out, I find that "solution" simply unacceptable. My household has 10 Apple products from Apple TV to iMac and everything in between, and in the many years of using the products and the otherwise superb support, this is the first time I'm an unhappy camper. I would hope that with the volume of complaints on the Apple support boards, the media will get wind of it and push Apple to do the right thing. There is a way to prevent the two iPhones (and/or iPads) from both ringing when one gets a call. On the device you do not want to ring, go to Settings --> FaceTime --> iPhone Cellular Calls and touch the slide switch to turn it off. After leave family sharing, I can't get items (paid and even free) from app store that old family organizer downloaded or used. How can I fix it? Any DRM-protected music, movies, TV shows, books, or apps you previously downloaded from other family membersâ€™ collections will no longer be usable, and other family members will no longer be able to use content downloaded from your collection. If you have made In-App Purchases from an app originally purchased by someone else, you will need to purchase the app yourself to regain access to your In-App Purchases. Speechless. Totally speechless. What is the reason for the 12 month lock-out? Apple can't explain it to me when I called them today. I'm now blocked for 12 months. Can't share anything. Will now cancel my Apple music family subscription and tempted to bin all Apple products. This is not acceptable at all and also seems pointless. Why are we blocked out for 12 months. Does anybody know the reason for this ?